When people say the Miracle Mile has turned into one of the top cultural hubs of Los Angeles, it isn’t just because of LACMA’s success. When it comes to bringing the community together to celebrate its own art, there are likely few, if any, more responsible for that reputation than the founder of TarFest, James Panozzo. Panozzo is a product of the Midwest but he brings mentalities from around the country to the Miracle Mile. He moved to Southern California in the early 1990s, but didn’t stay for long. He spent time in Los Angeles, San Diego and Arizona. While pursuing acting, he moved to Europe and then to New York City, where he was inspired by the active, pedestrian-minded settings, and places where they cherish summer months when they can spend time at parks and festivals in the streets. When Panozzo came back to Los Angeles, he explored the local art scene and noticed a significant absence of what he loved so much in New York. “In Manhattan, you walk out your door and you’re in it. It’s humanity,” he said. But he believed L.A.’s reputation revolved around spending more time in the car, or in the back yard or courtyard – features not as popular in New York. Panozzo teamed up with his friend and president of the Greater Miracle Mile Chamber of Commerce, Steve Kramer, and together they launched the first annual TarFest at LACMA and rented the rooftop on the May Company Building. It didn’t take long before other members of the Miracle Mile community and elected officials started to support TarFest. Attendance continues to grow each year, and Panozzo has built strong relationships with the LAPD, LAFD, and restaurant and bar owners along Wilshire Boulevard. 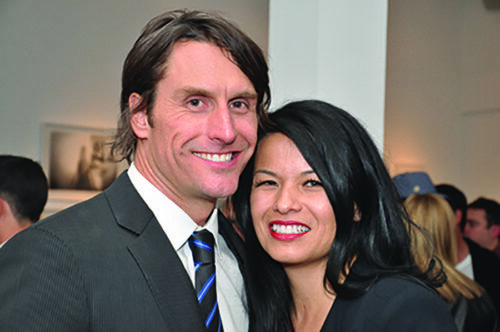 Panozzo was the director of the Lawrence Asher Gallery for six years, and in 2010 created the nonprofit LaunchLA around the belief that exposure to arts enhances the quality of life and strengthens communities. LaunchLA creates different gallery, festival and performance settings, and provides new avenues for neighborhood artists. Panozzo said TarFest has been different every year. 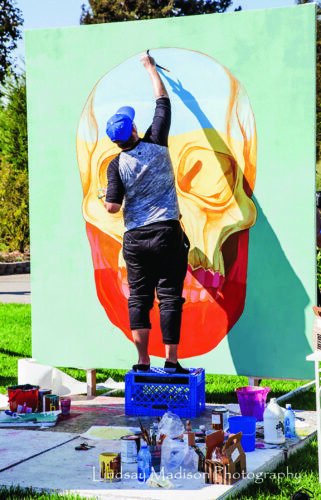 The festival’s 13th year in 2015 drew thousands and included a day full of music, dance performances, live art installments, museum exhibits and other activities for the whole family. “We’ll do it as long as we’re welcome,” he said. Panozzo, who is married to gallery owner Merry Karnowsky and a father now, said the last 14 years have taught him a lot. “Since I’ve been in L.A., since I’ve been part of the Miracle Mile, it’s really shaped me. And I hope I have contributed to why it has become so awesome,” he said.